New experiments have confirmed that dragonflies grow bigger with more oxygen, or hyperoxia. The giant dragonflies of ancient Earth with wingspans of up to 70 centimetres are generally attributed to higher oxygen atmospheric levels in the atmosphere in the past. However, not all insects were larger when oxygen was higher in the past. The secrets to why these changes happened may be in the hollow tracheal tubes insects use to breathe. Getting a better handle on those changes in modern insects could make it possible to use fossilized insects as proxies for ancient oxygen levels. To understand how paleo-oxygen levels would have influenced the evolution of insects, scientists decided to look at the plasticity of modern insects raised in different oxygen concentrations. The team raised cockroaches, dragonflies, grasshoppers, meal worms, beetles and other insects in atmospheres containing different amounts of oxygen to see if there were any effects. One result was that dragonflies grew faster into bigger adults in hyperoxia. However, cockroaches grew slower and did not become larger adults. In all, ten out of twelve kinds of insects studied decreased in size in lower oxygen atmospheres. But there were varied responses when they were placed into an enriched oxygen atmosphere. 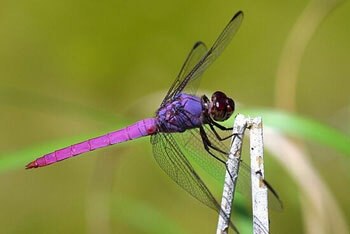 “The dragonflies were the most challenging of the insects to raise,” said John VandenBrooks of Arizona State University. One possibility is that the hyperoxic reared roaches stayed in their larval stage longer, perhaps waiting for their environment to change to a lower, maybe less stressful oxygen level. VandenBrooks and team took the hyperoxic-reared roaches to Argonne National Lab’s x-ray synchrontron imaging facility to get a closer look at the tracheal tubes. They found that the tracheal tubes of hyperoxic-reared roaches were smaller than those in lower oxygen atmospheres. That decrease in tube size with no increase in the overall body size would allow the roaches to possibly invest more in tissues used for other vital functions other than breathing – like eating or reproducing. The roaches reared in hypoxia (lower oxygen) would have to trade off their investment in these other tissues in order to breathe. The findings would be presented at the annual meeting of the Geological Society of America in Denver.